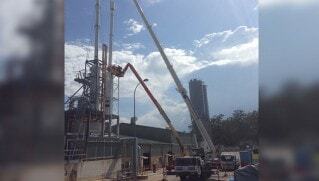 Complete your domestic or commercial project with excellence thanks to the effective cranes at Wildmans Cranes. Able to lift and hoist heavy loads and roofing materials we can safely assist in the positioning and installation of standard and awkwardly-shaped loads. 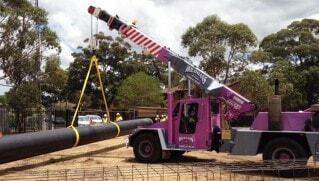 With the best cranes the team at Wildmans Cranes can supply the best construction equipment and machinery to worksites across Sydney’s metro area. Perfect for projects large and small our effective and safe equipment can make sure you complete your build on time and under budget. 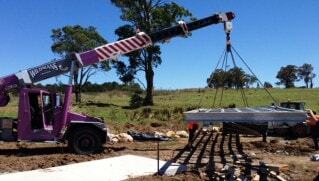 For Wildmans Cranes lifting, hoisting, positioning, and moving concrete forms in custom shapes is no issue at all. Our strong and varied range of cranes help carry slabs, bollards, barriers, and other concrete forms and supplies with ease and efficiency. Enjoy a simpler lifestyle thanks to the team at Wildmans Cranes. Our fleet of modern and well-maintained cranes can safely move logs for cabin construction into position, assisting in the construction of the building. 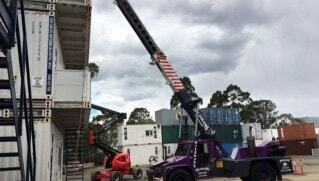 Using more than one crane simultaneously we keep your site safe while moving standard and oversized logs. Need power in a pinch? 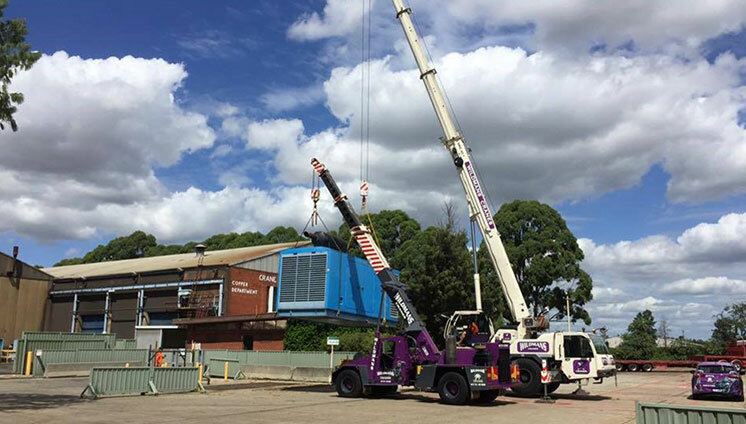 At Widlmans Cranes we can lift and position portable and fixed power generators across construction sites throughout Sydney’s metro region. Able to be lifted to different floors of your building our safe and registered cranes can help you complete your project without issue or delay. 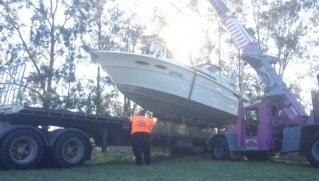 Transport your boat safely and without damage thanks to Wildmans Cranes. Our safe lifting techniques can hoist large pleasure craft onto trailers smoothly and evenly, allowing them to be transported securely to their new destination. Highly effective and very heavy, roof-mounted HVAC units can effectively heat or cool multi-level buildings. To get them safely onto the roof Wildmans Cranes’ fleet of mobile cranes are able to lift these units onto roofs securely and without putting installers or crane operators at risk. Improve the livability of your home thanks to Wildmans Cranes. Thanks to our mobile cranes and their range of motion we can precisely position and angle hot tubs, swimming pools, and spas into their desired location for a seamless installation process. 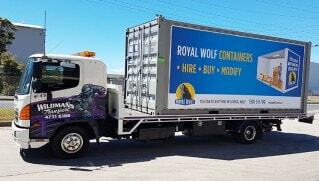 Don’t struggle trying to lift and move heavy and oversized furniture anymore thanks to the team at Wildmans Cranes. Easily able to lift loads of up to several tonnes our cranes can lift heavy or hard-to-carry furniture up to levels and floors that cannot be navigated by narrow stairs or small elevators. 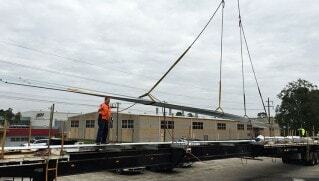 Cut down on your reliance on the power grid thanks to Wildmans Cranes. Our superior cranes can easily lift and shift solar panels and related materials and equipment promptly and without fault. 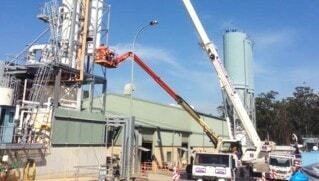 No matter the height of your building you can reach new heights thanks to Wildmans Cranes. 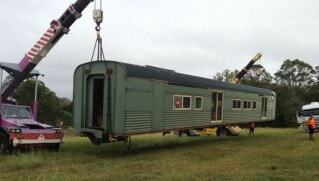 Get the space you need in your home thanks to Wildmans Cranes. Able to accurately shift and position sheets of metal and related materials our cranes can expertly assist with the construction of sheds. Whether large, small, yet to be assembled or pre-fabricated our team are here to help! Create the garden that you’ve always wanted thanks to the team at Wildmans Cranes. Working with both private residents and councils we can move infrastructure and plants into position with ease and accuracy, ensuring that they landscape meets the design. 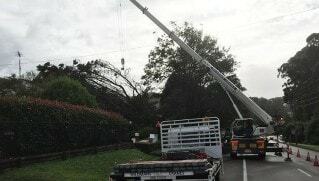 Get rid of dead, threatening, or troublesome trees without causing injury or damage to property or people thanks to the fleet of cranes at Wildmans Cranes. 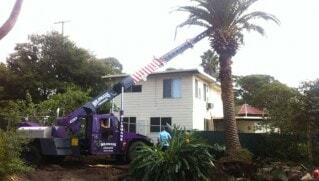 Able to hoist trees cleanly out of the ground we can swiftly remove trees with ease, roots and all, cutting down on removal times. 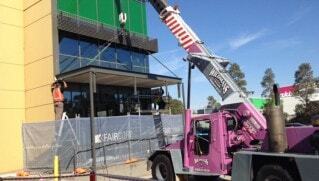 Raise your flag with pride thanks to the direct assistance of Wildmans Cranes. Able to hoist and plant flag poles of varying heights our safe and methodical solutions ensure that the flag pole does not pose a risk during the installation process. Perfect for residents and councils alike our team will work to ensure your flag pole stays standing. 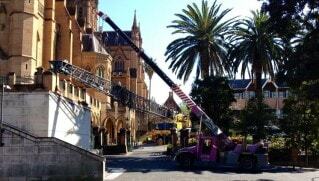 Make sure you get the clearest picture on your television thanks to Wildmans Cranes. Easily able to safely lift and hoist antennas for assembly or disassembly without damaging the infrastructure our cranes and workers can change your antenna array according to specifications. 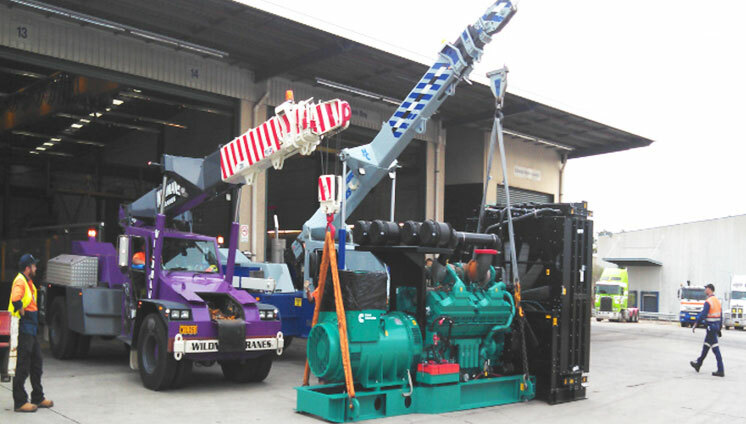 Don’t struggle to lift or install oversized generators or switch gears anymore thanks to Wildmans Cranes. Our safe and balanced fleet of cranes can easily move generators stably without causing damage to the generator, the building, or personnel. Whether in 20 or 40 foot lengths the team at Wildmans Cranes can promptly and professionally move and position shipping containers with ease. 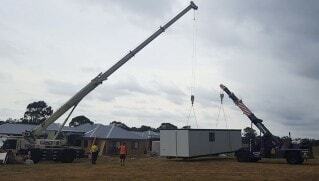 Whether for unloading stock or moving containers onto properties our mobile cranes can make moving or removing shipping containers quick and easy.